The present portrait of a young Breton girl is a remarkable paradigm of Charles Milcendeau’s fascination for the peasant life in Brittany and Vendée. Inspired by his home country – Milcendeau was born in the heart of the Breton marshland, better known as Marais Breton-Vendéen – the artist portrayed sober peasant interiors, landscapes filled with heavy skies and wet swamps, and persons of strong character. A former student of Gustave Moreau at the Ecole Nationale des Beaux-Arts in Paris, Milcendeau lived between Paris and Vendée, and ventured out to Brittany, Spain and Corsica. His many studies showcase his talent for drawing, yet he also mastered colour media such as pastel and gouache, as demonstrated with this particular sheet. Surrounding the young sitter with warm luminosity, Milcendeau shows us a Breton girl captivated by deep thoughts and her soft face without enforcing direct contact, with her head turned to the side. 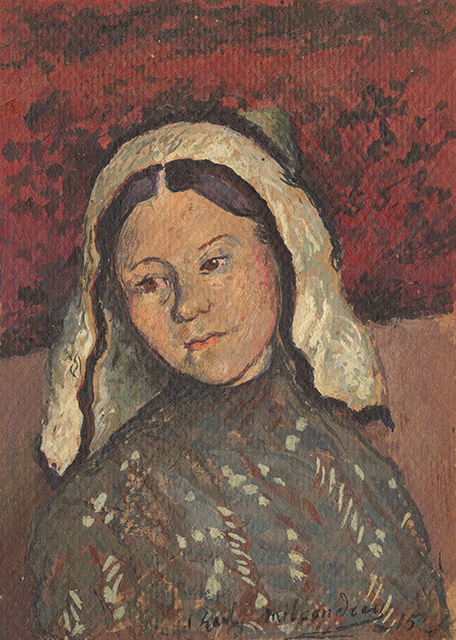 Her hair is covered by a typical white Breton veil, loosely falling on her shoulders, which surrounds her face and creates a halo of lightness – wonderfully juxtaposed with the broad, dark red brushstrokes in the background – converting her into nearly a saintly figure. The transparency of the girl’s contemplation and the uncovered sensitivity produce a beautiful work of art.